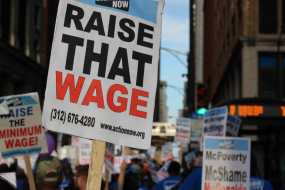 Businesses from across the state came together in Springfield on Monday to urge the Illinois lawmakers to amend a proposed minimum wage increase to allow for lower pay outside the city of Chicago. Gov. J.B. Pritzker last week urged the House to pass the Senate’s blanket $15 minimum wage by 2025 without any changes. Supporters of the minimum wage say it has taken too long for an increase to the minimum wage and that going to $15 an hour by 2025 will raise people out of poverty, add to the state’s tax rolls and increase economic activity. The Senate along party lines passed Senate Bill 1 that would have six increases over five years starting with the first increase Jan. 1, 2020, to $9.25 from the current $8.25. The wage would be $15 per hour by 2025. Karen Conn of Conn Hospitality with operations throughout central Illinois said Monday that the state should take a page out of its own reimbursement caps for hotels, which varies from Chicago, which can go up to $219 a night to suburban areas for $130. Further away it’s $80. In central Illinois, it’s $70 a night. Doug Knight owns and operates Knight’s Action Park in Springfield, which employees a lot of first-time workers. He said the proposed tax credits in the Senate bill won’t sell him on increasing the minimum wage. Manufacturer Don Welge of Gilster-Mary Lee said if employee costs continue to go up in Illinois, he’ll be forced to continue to invest outside the state, where he has other operations and he said it’s cheaper to higher. “So we’re just flirting with disaster folks, and I think our political leaders have got to start taking this seriously because if not, we’re going to do a great deal of damage to the rest of Illinois,” Welge said. While Welge said he pays most of his employees more than the minimum wage, the baseline would be increased if the minimum wage goes up. He said with workers’ compensation costs and unemployment insurance taxes, it already costs him $600 more per employee per year in Illinois than in Missouri. Illinois Retail Merchants Association President and CEO Rob Karr said the group wants the House to amend the bill to allow for a tiered-wage approach and a longer phase-in with a $15 an hour minimum for Chicago. “The suburbs to $13 over seven [years], you have to remember they’re starting at $8.25 like the rest of the state and then downstate would go to $11,” Karr said. The House is back Wednesday where they’re expected to take up the Senate’s measure. Whether they amend it is still up in the air.